Ben & Jerry's Hot Fudge Sauce: It is thick and grainy until you add cream and milk, and whisk over heat for 20 minutes. Ben & Jerry's Hot Burgundy Cherries: Cherries, cooked with sugar, lemon juice and zest. My bowl - all flavours combined into mush. A Cecconi's special: Vanilla ice-cream with fresh berries. Heaven in a glass! Nigella's "pure, unapologetic perfection": Apple ice-cream, butterscotch sauce and toasted, flaked almonds. The most popular flavours were chocolate-chip cookie dough, apple and vanilla. The other fruited flavours didn't move very much at all. The Ben & Jerry's flavours (mocha, butter-pecan, chocolate-chip cookie dough), were impressively easy to scoop, and didn't require as much softening time as the others. I tried to give everyone small scoops in small bowls so that we could try as much as possible, but by the end of the evening, we were all quite full and on a massive sugar high. Catherine: I'm so full - just on ice-cream! I didn't realise that was possible! What a wonderfully indulgent day! This is just a quick post to show y'all what we ate for Chinese new year's eve dinner on Saturday night. Every Chinese new year's eve the family gets together for reunion dinner, and we eat delicious Malaysian-Chinese food, prepared lovingly by my mum. Loh-Bak: Minced belly pork, mixed with spices, wrapped in beancurd skin and deep-fried. Mum serves it with batons of cucumber and a chilli/tomato dipping sauce. Kiam Chye-Th'ng: Salted Vegetable soup. This soup contains salted vegetables (available from your local Chinese grocery shop), with mushrooms, tomatoes, and duck maryland. Traditionally there is a pork leg in the soup as well, and you can easily add crispy roast pork or duck (from your local Hong-Kong BBQ takeaway shop) to bulk it up. The broth has a very rich flavour, and my mouth waters just thinking about it. Mmm! Curry Chicken Kapitan: A basic chicken curry, with a coconut milk and onion base. My mum now uses Aunty Winnie's recipe, which has lemongrass and kaffir lime leaves added. Fabulous! Look, deep down I know that Valentine's Day is a completely commercial holiday, designed by gift card-companies to make money. But some things are just too cute to pass up! I whipped up a batch of Nigella's Coca-Cola Cupcakes last night to commemorate this "holiday". (And really, there is no other way to describe the process; they are so deligtfully easy and cheap, that the only way you can make them is to "whip them up"). This also gave me a chance to break out these fab sprinkles that I bought recently. I love cupcakes, but I'm really over those overpriced Magnolia Bakery-wannabe cupcakes, covered with piped icing and perfect little sugar roses and hearts. They seem to be available at every bakery in Melbourne, and have been advertised like crazy in every Sunday newspaper colour supplement and women's magazine over the past few weeks. If you happen to be in the mood for a perfect cupcake, then my recommendation is to ignore the imitations and just bake a batch of Magnolia cupcakes from their recipe book. But let's go back to my decidedly imperfect cupcakes. I think that the slightly wonky look of these cupcakes adds to their charm. That's my excuse, anyway. They would make a lovely gift. Or better yet, it would be a really cute idea to make and decorate these with your loved one on Valentine's Day, (if your loved one goes in for that sort of thing). Nigella's Coca-Cola cupcakes are particularly suitable for romantic baking with your partner because the icing is very sweet and sticky, and tends to be quite messy. You know what I mean. If, however, you are single on Valentine's Day, and the whole thing's getting you down, then make the cupcakes anyway and eat them all yourself. Muahaha! To tell the truth, I hadn't planned on making Nigella's Dime Bar Ice-Cream at all. It just sounded too plain - an ordinary egg custard, chilled and churned, with processor-pulverised Dime Bars folded through. However, numerous visits to Ikea in the past month prompted me to change my mind. You know how it is. You walk into Ikea looking for a new study desk, and you walk out with an entire bedroom set, some cute candles, a set of cheap bowls, a bunch of Swedish food products, and a brand new credit card debt. On my last trip to Ikea, I bought a bag of frozen Swedish meatballs, a flavouring packet for cream sauce, and more Dime Bars than I care to admit. These ingredients ended up as a fab weekday lunch. Dime Bars, (or "Daim" in Swedish), for those of you who don't know, are milk chocolate bars filled with a crunchy almond caramel centre. They stick to your teeth when you eat them. Fabulous. As I explained above, the ice-cream is pretty straightforward to make. The only variation I made to the recipe is that I added Daim Dragées (i.e. Dime Bars in tiny ball form), for extra crunch and interest. I was still worried, you see, that the finished ice-cream would be boring, and I wanted it to be "Daimtastic". So, the meatballs. You just have to heat the meatballs through in the oven, make up the sauce by heating the powder with some water and cream, pour the sauce over the balls, and Sven's your uncle. 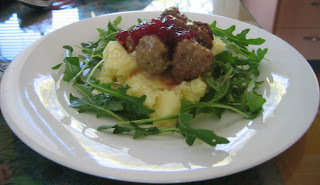 We had them with mashed potatoes and rocket. They were very nice, but quite salty and artificial-tasting, which is what you would expect from packet food, I suppose. Tessa Kiros has a recipe for Finnish meatballs in either Falling Cloudberries or Apples for Jam, and I'm really looking forward to trying it. The ice-cream turned out surprisingly well! It was creamy, easy-to-scoop, and had a fabulous chewy texture thanks to the processed Dime Bars. Dime Bar ice-cream in a brand new $2 bowl from Ikea. Truly Daimtastic! More Donna Hay. This time I made the double chocolate cookies from Modern Classics Book 2 to while away a lazy Saturday afternoon with a friend of mine. They're simple and delicious - less than an hour of mixing, squishing and baking gives you a trayful of warm cookies and a kitchen full of gorgeous smells. I cannot tell a lie; I made those cookies primarily to take this cute photo with my Cookie Monster doll. This delightful triple-chocolate semifreddo served as a birthday cake for my cousin Catherine's birthday dinner tonight. The last time I cooked dinner for my relatives, Catherine was flicking through Falling Cloudberries, and I suggested she bookmark the recipes that looked good so that I could make them for her sometime. Obviously the dessert wasn't chosen by Catherine - she'd chosen loukmades - but the forecast was 38C and sunny. Definitely not the weather for deep-fried balls of sweet and yeasty goodness. Next time, next time. I made the semifreddo a couple of days in advance (see below for description of the process), soaked the chickpeas the night before, and made the rest of the dishes on the day. For the chickpea salad, you start by soaking and cooking some chickpeas. Tessa says that tinned ones work fine, but I had a couple of bags sitting around. Next, you cook a red onion with garlic and red chillies in olive oil and leave it to cool. Once everything is cooked and cooled, you mix the drained chickpeas with the onion mixture, lemon juice, crumbled feta, spring onions, coriander and parsley. It sits happily in the fridge until you need it. The chicken needs to be fried in butter and oil until browned, and then grilled under a high heat with some water, lemon juice and oregano. This crisps up the skin, cooks the chicken through, and makes a little sauce. I didn't dress the green salad, or offer butter with the bread. Left plain and simple, they were the perfect foil for the rich dishes, mopping up the buttery juices. I think the chickpea salad was the most popular of all the dishes, although my dad loved the chicken. I was really impressed by the freshness of the calamari - I'd bought it a few weeks ago at Box Hill when it looked too good to pass up, but stashed it in the freezer, knowing I wouldn't cook it immediately. It was soft and flavourful, without a hint of rubberiness. Phew! We were absolutely stuffed after the meal, so the grown-ups got up to do the washing, whilst my cousin, a friend and I went on an appetite-building walk. Here's the semifreddo. It was a bit tough to slice, especially on a pretty white plate, so I transferred it to a heavy-duty wooden board, dipped my largest roasting knife in hot water and got slicing. It was very, very rich and chocolatey, and as it melted, the texture became more moussily soft, and the chocolate flavour became more pronounced. Lovely! This triple-chocolate semifreddo recipe comes from Donna Hay's Modern Classics, which I received as a gift for my 21st birthday. I have to admit that I have a bit of a love-hate relationship with Donna Hay's work. On one hand, her pictures look so fake! They are pretty, but look so stylised and so far removed from anything you'd would serve at home, that they don't look particularly edible. On the other hand, her books and magazines are a useful resource of dozens of basic recipes, and her recipes can be pretty fabulous. Her melt-and-mix white chocolate mud cake with white chocolate frosting is divine! I used it as the birthday cake for my 20th birthday, and 5 years ago, for my mother's... umm... birthday. I don't normally look through my Donna Hay books, but I recently loaned Modern Classics 1 & 2 to a friend who's living out of home at the moment. Before parting with these cookbooks, I had a read through them, and, looking beyond the artistically arranged picture that I knew I'd never be able to replicate, was tempted by the semifreddo recipe. A semifreddo is a bit different from an ice-cream. If homemade ice-cream is a churned and frozen custard, then semifreddo is an unchurned, frozen mousse. You start by whisking eggs, egg yolks and sugar with an electric hand held mixer in a double boiler until thick and pale, then take it off the heat and continue beating until the mixture room temperature. However, once it came time to remove it from the heat, my 20-year old Chefette mixer (and more importantly, my 22-year old arms!) were feeling the strain, so I put the mixture into my KitchenAid mixer, and let it whisk. Once the mixture is cool, you fold through melted dark chocolate, followed by whipped cream, and a mixture of white and milk chocolate chips. Then it's simply a matter of putting it in a gladwrap lined tin, covering it well, and freezing it until solid. There was a bit too much mixture to fit in my tin, so I shared the remainder with my parents as a "triple chocolate mousse". It was good. In fact, I'm not sure I don't prefer this semifreddo in its unfrozen, mousse-like state. On the night I served it, I unmoulded it onto a plate, drizzled melted white and dark chocolate over it in a decorative fashion, and tumbled fresh strawberries on top. After a big day of shopping at the market, we were very ready for lunch. I cooked the mussels (which had to be cooked ASAP) in the Belgian style, and serve it with roasted potatoes. The lady at the potato stall did say you could eat the mini potatoes simply deep fried, instead of chips. So I guess our lunch was kind of like moules et frites. Having a bit of goosefat leftover from Christmas, I decided to roast the potatoes instead of deep frying them. (There was also less splatter that way). I just par-boiled them, and then roasted them for 30 minutes in a super-hot oven with the goosefat. Yummy. While they were roasting away, I got on with the mussels. Using Nigella's recipe from How to Eat, I sauteed garlic, chopped parsley and a finely chopped onion in butter, added some white wine, turned the heat up, dropped the mussels in, and clamped the lid on. It only took about 4 minutes to cook, shaking the pot every now and then to disperse the heat and ensure even cooking. The potatoes had a great potato flavour, crunchy skin, and a nice fluffy middle to soak up all the winey, mussely juices. Halfway through eating, however, I realised that, nice though the potatoes were, I desperately needed bread - real, sourdough crusty bread - to soak up the juices. We didn't really have that type of bread at home, so I have to admit I stole the ciabatta bread from the outside of my yet-to-be-eaten ham panino from the Convent. (I saved the filling in the fridge for the next day, and ate it between less glamorous bread). The ciabatta was perfect for the job.